My Mum is English by ancestry, and has for a number of years been making one of her family’s traditional recipes to go with Thanksgiving and Christmas dinner. I think it’s really yummy, so I asked her if I could share it. Here it is, mostly verbatim – I just separated out a list of ingredients for easier shopping. Stick the cloves in the onion. Add onion to milk in a saucepan. 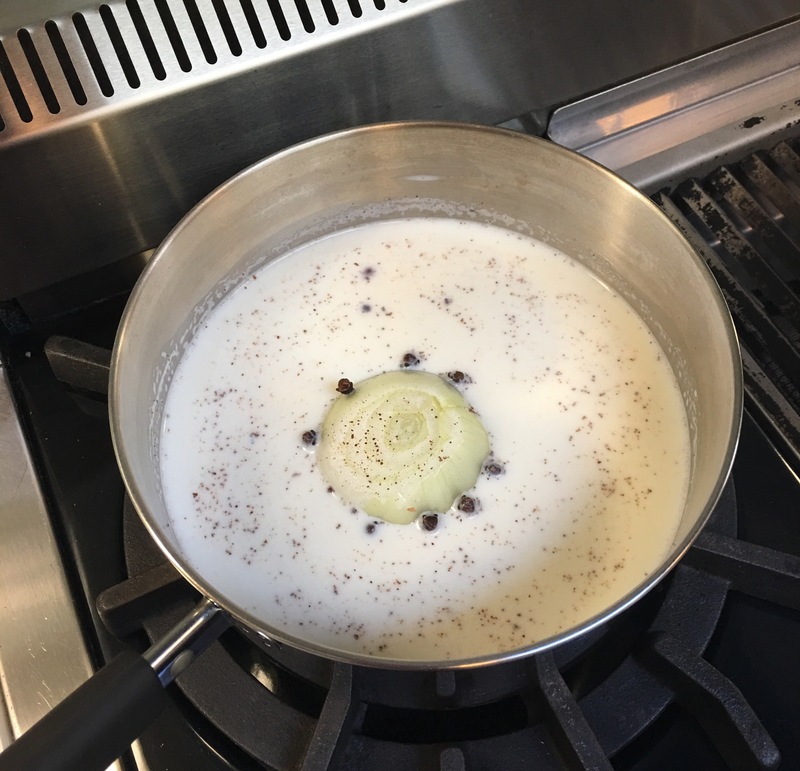 Simmer for about one hour on low heat, so that milk is infused with the onion-clove flavour. Do not boil. Add salt and about 1 cup bread crumbs, and simmer over low heat. Again, do not boil. The crumbs will swell up, and the sauce should have a thick consistency. If it is too runny after simmering for a few minutes, add some more bread crumbs. Serve with turkey, ideally with more bread crumbs, these ones fried in butter. About a half cup should be enough – use whatever you have left. I was intrigued reading your recipe from your English Mum. The constant swapping of customs around the world. The Bread Sauce looks a good English recipe. The turkey mentioned, came to Britain from the American Thanksgiving, and replaced the traditional English goose for xmas dinner. 100 years ago it would have been “the six legged goose” for Christmas dinner, with bread sauce. A six legged goose refers to the old practise of adding a rabbit or two to increase the volume of meat on the goose to feed a large family. In the early 20th Century the six legged goose gave way to the goose or chicken with a few sausages added to bolster the meat component. When the American turkey took hold in Britain in the later 20th Century, the sausages themselves disappeared because there was too much meat on a turkey for the smaller families that prevailed. Bread sauce disappeared at the same time, with only a small amount of stuffing left. Love the entry. Keep up the good work! Thank you!